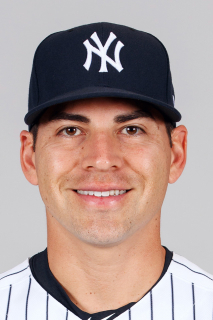 Full name is Jacoby McCabe Ellsbury… is married to Kelsey…the couple has two daughters, Emery (born October 2015) and Crew (born February 2017)...Is believed to be the first Native American of Navajo descent to play in the Majors…visited family on Navajo reservations in Arizona and New Mexico as a child…his mother is a full Navajo Native American and works for the Confederated Tribes of Warm Springs in Oregon…his father is a former forester for the Bureau of Indian Affairs...Graduated from Madras (Ore.) High School, where he hit .430 with 3HR and 20RBI his senior year, earning league Co-Player of the Year honors...Attended Oregon State University… hit .365 (236-for-646) with 168R, 37 doubles, 16HR, 101RBI and 60SB in 160 games over three seasons with the Beavers… posted a .990 fielding percentage, making just 4E in 391TC… set the Oregon State record in career runs scored and his 99H in 2005 marked the most in a single season in Beavers history… garnered 2005 Pac-10 "Co-Player of the Year" honors and was named to the 2005 Louisville Slugger All-America Second Team and College Baseball Foundation's National Honors Team… as a sophomore in 2004, hit .352 in 49 games and was selected to the All-Pac-10 First Team and the Baseball America Mid-Season Sophomore All-America Team… received Pac-10 All-Academic Honorable Mention in 2004 and '05…his 2005 Oregon State University baseball team played in the College World Series and was inducted into the school's Athletics Hall of Fame in the fall of 2015…in 2016, was named a Pac-12 All-Century Outfielder...In 2014, committed $1 million to help the Oregon State University baseball program expand its locker room facilities at Goss Stadium...Has hosted the Nike N7 Baseball Camp during the offseason, which promotes healthy lifestyle choices and teaches baseball technique to Native American children in Arizona…supports the Southwest Reservation Aid (formerly Navajo Relief Fund), which helps build self-sufficient Native communities...While with the Red Sox, attended events benefitting the Red Sox Foundation, including Dancing with the New Stars, the Welcome Home Dinner and Picnic in the Park…also visited with Jimmy Fund and Make-A-Wish patients...Launched a charity wine (Zinfandellsbury) in 2010 with proceeds benefitting the Southwest Reservation Aid (formerly Navajo Relief Fund), Project Bread and the Ellsbury-Read Project...Was named Male Professional Athlete of the Year at the Oregon Sports Awards on 2/12/12 in Beaverton, Ore.… his hometown of Madras, Ore. had a parade in his honor in November 2007...Competed for Falmouth of the Cape Cod League in 2004. Spent the entire season on the disabled list…was placed on the 10-day D.L. on 3/29 (retroactive to 3/26) with a right oblique strain…was transferred to the 60-day D.L. on 5/2...Underwent arthroscopic surgery on his left hip to repair a torn labrum on 8/6…the surgery was performed by Dr. Bryan Kelly at the Hospital for Special Surgery in Manhattan. Batted .264 (94-for-356) with 65R, 20 doubles, 4 triples, 7HR, 39RBI and 22SB in 112 games (90 starts in CF, 3 at DH) with the Yankees…reached the 20SB plateau for the ﬁfth straight season and eighth time in his career (2008-09, '11 and '13-17)…hit in every spot in the starting lineup except third…hit fourth in the starting lineup 11 times and fifth 11 times this season after never starting in either position in his career prior to this season... Reached base safely in 25 straight games (w/ a PA) from 9/26/16-4/26/17, batting .337/.416/.438 (30-for-89) with 14R, 3 doubles, 2HR, 8RBI, 11BB, 7SB and 1HP... in those games over the stretch…at the time the streak was snapped, had been tied with Seattle's Mitch Haniger for the longest active on-base streak in the Majors…was his longest such streak as a Yankee and the second-longest on-base streak of his career (26G, 7/2-9/26/07)... Hit grand slam-the ﬁrst grand slam of his career and his 100th career HR-in 4/28 win vs. Baltimore…became the ﬁrst Yankee to hit a grand slam for his 100th career homer since Matt Nokes on 5/13/92 vs. Seattle…became just the second player in Baseball history to his his ﬁrst career grand slam as his 100th career home run, joining Bryce Harper. Batted .263 (145-for-551) with 71R, 24 doubles, 5 triples, 9HR, 56RBI and 20SB in 148 games (138 starts in CF) with the Yankees…reached the 20SB plateau for the fourth straight season and seventh time in his career (2008-09, '11 and '13-16)…had a team-leading 12 game-winning RBI. Reached on catcher's interference 12 times in 2016, the most ever by a player in a single season, surpassing Roberto Kelly (8CI in 1992). Pinch-ran for Headley and was caught stealing in the ninth inning of 4/19 loss vs. Oakland and remained in the game in CF (did not bat)…was his first pinch-running appearance since 4/19/11 at Oakland w/ Boston. Recorded a straight steal of home with two outs in the fifth inning of 4/22 win vs. Tampa Bay (off Matt Moore)…was his second career straight steal of home (also 4/26/09 w/ Boston vs. the Yankees off Andy Pettitte)…was the first Yankee with a straight steal of home since Gerald Williams on 5/29/93 vs. Chicago-AL and the first overall steal of home by a Yankee since Chris Young on 9/13/14 at Baltimore (part of a double steal with Antoan Richardson)…entered the game defensively in CF in the fifth after Hicks was removed with a sore left shoulder…also stole home on the front end of double steal on 6/4 at Baltimore (with Gardner). Snapped a 189AB homerless stretch with a solo HR in 4/25 win at Texas (first homer since 8/30/15 at Atlanta). In 22 games in May, hit .320 (24-for-75) with 13R, 4 doubles, 3 triples, 1HR and 6SB and a .900 OPS…was his second-highest monthly OPS mark since the start of 2012 (.905 in August 2014). Played in his 1,000th career game in 5/4 win at Baltimore, reaching base safely five times (3-for-3, 1R, 1 double, 2BB)…was the fourth game in his career (third as a Yankee) in which he reached base safely in every plate appearance (min. 5PA) and first since 5/3/15 at Boston (4-for-4, 1BB, 1HP)…also reached base five times on 5/18 at Arizona (3-for-3, 2BB). Walked, had 2SB and scored a run in the first inning of 5/6 win vs. Boston before being removed defensively in the top of the second with a tight right hip…missed the next seven games with the injury (5/7-13). Drew a walk in five straight games from 6/8-12, tying a career high (4/9-16/08). Had an RBI in four straight games from 8/7-11, tied for the second-longest streak of his career (5G, 8/25-29/14). Hit 5HR over his final 38G of the season (from 8/19-10/2) after hitting just 1HR in his previous 58G (6/9-8/16). Hit leadoff HR in 8/19 win at Los Angeles-AL…was his 13th career leadoff HR (first since 8/2/15 at Chicago-AL). Tied his career high in hits (15th time) in 8/30 win at Kansas City, going 4-for-6 with 1 double and 2RBI…drove in the game-winning run in the 10th, his fifth career extra-inning go-ahead RBI and first since 7/9/14 at Cleveland. Missed two games (9/18-20) with a right knee bone bruise…was 0-for-4 in 9/17 loss at Boston before being removed from the game in the bottom of the eighth with the injury, which was sustained sliding into the CF wall attempting to catch a Bogaerts double in the seventh. Over his final seven games (9/26-10/2), reached base safely in 15-of-26 plate appearances (8H, 6BB, 1CI). Had RBI singles in both the eighth and ninth innings of 9/26 win at Toronto, accomplishing the feat for the first time in his career (credit:Elias). Missed six spring training games with a bruised right wrist after being hit by a pitch on 3/19. Batted .257 (116-for-452) with 66R, 15 doubles, 2 triples, 7HR, 33RBI and 21SB in 111 games (106 starts in CF) with the Yankees…reached the 20SB plateau for the third straight season and sixth time in his career (also 2008-09, '11 and '13-14)...Hit 6HR over his final 71 games (from 7/11) after hitting just 1HR in his first 40 games of the season (4/6-7/10)...The Yankees went 47-26 when he had at least 1H, 25-9 w/ at least 2H and 14-24 when he had 0H…were 35-17 when he scored at least 1R…were 34-16 when he reached base safely (via hit, walk or HBP) at least twice in a game...Finished April with a team-high 27H and 8SB after posting 29H and 8SB in March/April 2014 to become the second Yankee with at least 25H and 8SB in March/April of consecutive seasons, joining Rickey Henderson (34H/20SB in 1988, 27H/14SB in 1989)…logged 32H and 11SB in March/April 2013 and is the first Major Leaguer to post those minimums in the opening month of three straight seasons since Eric Young from 1998-2000...Had a streak of 16 consecutive successful SB attempts from 7/18/14-4/8/15 (snapped on 4/9 vs. Toronto)... Played all 19 innings of 4/10 loss vs. Boston in CF, going 2-for-9...In 24 games from 4/22-5/19, hit .363 (33-for-91) with 19R, 3 doubles, 1HR, 6RBI, 12BB and 11SB...Hit safely in a season-high 11 straight games from 4/27-5/8, batting .489 (22-for-45) with 10R and 7SB…was his 14th career double-digit hitting streak...Reached base safely a career-high six times and tied his career high with 4H in 5/3 win at Boston (4 singles, 1BB, 1HP)…was the first Yankee to reach base safely six times in a game since Russell Martin on 8/25/11 vs. Oakland…according to Elias, over the last 50 years, only two other Yankees have reached base safely six times in a nine-inning game out of the top slot in the lineup-Rickey Henderson on 6/17/85 at Baltimore and Johnny Damon on 6/7/08 vs. Kansas City...Had 1SB in each of three consecutive games from 5/14-16…immediately following that stretch, went a career-long 34 straight games without a stolen base from 5/17-8/17... Was placed on the 15-day disabled list from 5/20-7/8 with right knee sprain (missed 43 team games)…suffered the injury while swinging in fourth-inning AB on 5/19 at Washington…was 2-for-13 with 1R in four rehab games (3-CF/1-DH) with Single-A Tampa...In 7/28 win at Texas, became the second player since 1980 to reach base twice on catcher's interference in a game (also Texas' David Murphy, 4/11/10 vs. Seattle) and the first player ever to do so vs. two different catchers in a game...Hit leadoff HR in the first and was 1-for-3 with 3RBI, 1SF and 1BB in 8/2 win at Chicago-AL…was his 12th career leadoff HR and first since 5/1/14 vs. Seattle...Hit game-winning solo HR in the seventh and was 2-for-4 in 8/6 win vs. Boston…was his fifth career go-ahead HR in the seventh inning or later and third as a Yankee (also 5/24/14 at Chicago-AL and 7/9/14 at Cleveland)...Had a career-long 17-game stretch without an RBI from 8/31-9/19...Reached base safely in 12 of his last 14 starts of the season (9/16-10/4), batting .290 (18-for-62) with 9R, 5 doubles, 3RBI and six multi-hit games in 16 total games over the span...Snapped a career-long 0-for-25 stretch with a first-inning single in 9/16 win at Tampa Bay (previous careerlong was 0-for-22 in 2010)...His third-inning stolen base in 9/24 win vs. Chicago-AL was the 300th stolen base of his career...Hit .200 (7-for-35) in 12 spring training games…missed two weeks at the end of March with a strained oblique. Batted .271 (156-for-575) with 71R, 27 doubles, 5 triples, 16HR, 70RBI and 39SB (in 44 attempts) in 149 games(138 starts in CF and ﬁve at DH) with the Yankees…marked his most games, home runs and RBI since 2011…ledthe team in hits, doubles and stolen bases... Collected his ﬁrst hit as a Yankee with a ﬁrst-inning double in 4/4 win at Toronto... Hit leadoﬀ HR-his ﬁrst HR as a Yankee-in 5/1 loss vs. Seattle…was his 11th career leadoﬀ HR (ﬁrst since 9/29/13 at Baltimore w/ Boston) and second at Yankee Stadium (also 6/7/11 oﬀ Freddy Garcia)…was the ﬁrstleadoﬀ HR by a Yankee since Derek Jeter on 8/21/12 at Chicago-AL and ﬁrst by a Yankee at home since Jeteron 6/20/12 vs. Atlanta... Stole his 250th career base in the third inning of 5/2 loss vs. Tampa Bay…went 4-for-6 with 1RBI and 1BB inthe game, tying his career high in hits (11th time)... Drove in a run in four straight games from 5/23-26 immediately followed a career-long 16-game span without an RBI from 5/4-22... Hit game-winning solo HR in the 10th and was 2-for-5 with 2R in 5/24 win at Chicago-AL…was his third careergo-ahead home run in the ninth inning-or-later and ﬁrst since a 14th-inning three-run HR on 9/25/11 (Game 2) at Yankee Stadium w/ Boston (oﬀ Scott Proctor)... Hit safely in a season-high 17 straight games from 5/26-6/13, batting .373 (25-for-67) with 9R, 2HR and 13RBIover the stretch…was the longest hitting streak by a Yankee since Derek Jeter in 2012 (19 games - 9/4-25)and the longest by a Yankee in his ﬁrst season with the team since Steve Sax in 1989 (credit: Elias)…was his13th career hitting streak of at least 10 games... Drove in the game-winning run in four straight games (6/10-13), the longest such streak by a Yankee sinceReggie Jackson from 8/10-12(G2)/77-credit: Elias, accomplished the feat for the ﬁrst time in his career... Hit three-run HR and was 2-for-5 with 2R, 1 double and 4RBI in 7/6 win at Minnesota…marked the second-highestsingle-game RBI total of his career behind only a career-high 6RBI on 8/6/11 vs. the Yankees (w/ Boston)... Hit game-winning solo HR in the 14th and was 3-for-7 with 2R and 1 double on 7/9 at Cleveland…hit two of the Yankees' four extra-inning home runs in 2014 (also 5/24 at Chicago-AL in a 4-3 win) and became the ﬁrstYankee to hit two extra-inning homers in one season since Curtis Granderson in 2010 (credit: Elias... Tied his career high in hits (12th time) in 7/20 win vs. Cincinnati, going 4-for-4 with 1R, 1 double, 1RBI, 1BBand 2SB…was his second four-hit game of the season (also 5/2 vs. Tampa Bay, 4-for-6 in 14 innings)... Stole his 30th base of the season on 8/10 vs. Cleveland, becoming the ﬁrst Yankee to steal at least 30 basesin a season since Brett Gardner had 49 SB in 2011... Was named the AL "Player of the Week" for the period from 8/25-31…hit .522 (12-for-23) with 6R, 1 double,4HR and 9RBI in six games over the stretch…was his second career weekly award (also 6/6-12/11)... Hit 4HR in a ﬁve-game stretch from 8/25-29…hit two solo HRs and was 3-for-4 in 8/26 loss at Detroit…wasthe ﬁfth two-homer game of his career (last on 8/6/13 at Houston)…hit two-run HR and was 3-for-5 with 2Rand 3RBI in 8/25 win at Kansas City…his seventh-inning single was the 1,000th hit of his career... Drove in at least one run in a career-high ﬁve straight games from 8/25-29 (9RBI total)... Did not play in 8/30 loss at Toronto (sprained right ankle)... Missed the ﬁnal 10 games of the season (9/19-28) with a right hamstring strain…hit two-run HR and was2-for-3 with 2R, 1 double and 3RBI in 9/19 win vs. Toronto before being removed from the game before theﬁfth inning with the injury... Hit .174 (4-for-23) with 5R, 2 doubles, 1HR, 1RBI and 5BB in nine spring training games…was scratched fromthe lineup on 3/16 with a sore left calf and did not play in an oﬃcial game for the remainder of the spring. Batted .298 (172-for-577) with 92R, 31 doubles, 9HR, 53RBI and 52SB in 134 games-all from the leadoff position-with Boston… led all Major League leadoff hitters in games with a hit (105) and all AL hitters with 172H when batting first… tied for third in the Majors with 8 triples... Hit three leadoff homers (7/11 at Seattle, 7/19 vs. New York-AL and 9/29 at Baltimore)... Led the Majors with 52SB in 56 attempts… his 92.9% success rate was the best of his career in a full season and ranked second among Major Leaguers with at least 20 stolen base attempts behind only Kansas City's Alcides Escobar (100.0%, 22-for-22)… marked the best stolen base percentage by any Major Leaguer with at least 50SB since caught stealing became officially tracked in 1951... Became the first Major Leaguer to finish a season as Baseball's leader in both stolen bases and stolen base percentage (min. 30SB) since Tim Raines with Montreal in 1981 (71SB/11CS, 86.6%)… was the first player to accomplish the feat in a non-strike season since Bert Campaneris with Kansas City in 1967 (55SB/16CS, 77.5%)-credit: Elias... Had 17 games with at least 3H, tied for third in the Majors behind Detroit's Victor Martinez and St. Louis' Matt Carpenter (18 each)... Had four hitting streaks of at least 10 games (19 straight from 6/19-7/11, 12 from 4/10-22, 11 from 5/26-6/12 and 10 from 7/26-8/4)… marked the second-most double-digit hitting streaks in 2013 behind only Detroit's Miguel Cabrera (five)... Ranked fourth in the AL with a .328 (120-for-366) average vs. RHP… hit .323 (64-for-198) with runners on base, including a .500 (6-for-12) mark with the bases loaded... Batted .375 (30-for-80) in 19 Interleague games, hitting safely in 17 of those contests... Set a Red Sox club record with 11SB in April, breaking his own record of 10SB in April 2009... Scored the "walk-off" run in the 10th inning on 4/13 vs. Tampa Bay… singled, stole second base, advanced to third on an error and scored on Shane Victorino's infield single... Stole the 200th base of his career on 4/26 vs. Houston, becoming the third Red Sox player to reach the mark, along with Harry Hooper (300) and Tris Speaker (267), and the first to do so in the Live Ball Era (since 1920)… reached the mark in his 604th career game, fewest in Red Sox history... Recorded his fourth career "walk-off" hit with a ninth-inning, two-run double on 5/26 vs. Cleveland, marking his third "walk-off" hit vs. Cleveland (also 8/2/11 and 8/3/11) and second off Joe Smith... Scored at least one run in a career-high 10 straight games from 5/27-6/12 (12R total)… was the longest such streak by a Red Sox player since Kevin Youkilis did so in 11 consecutive games from 5/16-28/06… had both a hit and walk in all 10 games, becoming Boston's first player to accomplish the feat since Johnny Damon did so in 11 consecutive games from 8/24-9/8/04... Set a career high and Red Sox franchise record with 5SB on 5/30 at Philadelphia… the previous mark of 4SB was set by Jerry Remy on 6/14/80 at California and matched by Ellsbury on 8/9/10 at New York-AL… marked the most stolen bases in a game by any Major Leaguer since Tampa Bay's Carl Crawford had 6SB on 5/3/09 vs. Boston… also tied a career high by reaching base five times in the game (fifth time, first since 9/13/11 vs. Toronto)... Missed five games from 5/31-6/5 with tightness in his left groin... Recorded a stolen base in six consecutive games from 6/8 (Game 1)-6/13 (9SB total)… according to Elias, was the longest streak by a Red Sox player since Tris Speaker's eight straight games with a steal from 5/19-30/1913... From 6/8-12, became just the second Red Sox player since 1922 to have a streak of five straight starts with at least 1R, 1H and 1SB, joining Tommy Harper from 6/1-8/74... Hit safely in an AL-season-high 19 straight games from 6/19-7/11, batting .413 (33-for-80) over the stretch… was the second-longest hitting streak of his career behind a 22-game streak from 5/2-27/09... Matched his career highs on 8/6 at Houston with 2HR (fourth time, first since 9/25/11-Game 1 at New York-AL) and 4R (third time, first since 9/13/11 vs. Toronto)... Over his final 12 games of the season (8/27-9/29), hit .353 (18-for-51) with 13R, 3 doubles, 2HR, 6RBI and 5SB... Missed 16 team games from 9/6-24 with a right foot fracture... In 16 playoff games, batted .344 (22-for-64), leading all postseason participants in hits and runs (14) en route to winning his second career World Series championship with Boston (also 2007). Limited to 74 games due to a right shoulder subluxation suffered on 4/13 vs. TB.Hit at a .315 clip (39-for-124) in 30 games at Fenway compared to .240 (43-for-179) in 44 road contests.Made 49 starts in the leadoff spot...Also made 12 in the 2-hole, 10 in the 3-hole, and 1 in the 6-spot...Hit .364(20-for-55) while starting 2nd in the order.Hit safely in 7 of 8 contests against the Rays, batting .469 (15-for-32) with 7 RBI...Was the top mark vs. TBin 2012 (min. 30 PA).Started each of BOS's 1st 7 games before getting injured...Made 5th straight Opening Day start for the RedSox on 4/5 at DET, his 4th in center field (also LF in 2010).Suffered the right shoulder subluxation in the Red Sox home opener on 4/13 vs. TB, colliding with Rays SSReid Brignac in the bottom of the 4th while trying to break up a double play.Placed on 15-day DL on 4/14 and transferred to 60-day DL on 5/13...Missed 79 of BOS's games before beingactivated on 7/13...Played in 8 rehab games between the Rookie GCL Sox, Double-A Portland, and Triple-APawtucket from 6/29- 7/8, going 5-for-27 with 2 doubles, a homer, 3 RBI, 5 runs, and 4 walks.Hit in 47 of 66 games with a PA after coming off the DL on 7/13...Batted .278 (77-for-277) with 16 doubles, 4homers, 23 RBI, 39 runs, and all 14 stolen bases on the year...Tallied at least 1 hit in 9 of his 1st 11 games afterbeing activated (17-for-49, .347) and recorded a .304 AVG (21-for-69) in 17 games overall in July.T-2nd in the majors with 11 doubles in August...Tied for his most in a single month, also September of 2011.Stole a team season-high 3 bases 8/9 at CLE, the most thefts by a Red Sox in a game since he tied the clubrecord with 4 on 8/9/10 at NYY.On 8/16 at Camden Yards, snapped a 38-game hit streak against Baltimore dating back to 4/17/09...Batted.418 (71-for-170) with 14 doubles, a triple, 8 homers and 25 RBI in that 38-tilt span...According to Elias, itmarked the 2nd-longest stretch since 1900 for any player versus any single team behind only Vladimir Guerrero's 44-game hit streak vs. TEX from 4/9/04-8/4/06.Tallied a season-long 8-game hit streak from 8/21-28 over which he batted .405 (15-for-37, 5 RBI, 9 R)...Notched a career-long, tying 6-game multi-hit streak from 8/23-28, the longest multi-hit streak by a Red Soxbatter in 2012...Was 13-for-28 (.464) with 5 RBI and 9 runs scored in that stretch, scoring at least 1 run in eachof those tilts...Matched Albert Pujols (7/30-8/4) for the longest streak with at least 2 hits and 1 run in 2012.Celebrated 29th birthday on 9/11 and tied career high with 4 hits (8th time), knocking in the game-winningrun with a walk-off single in the 9th...Marked his 3rd career walk-off hit...Since 1916, the only other Sox playerto record 4 hits on his birthday was Carl Yastrzemski on 8/22 in 1961 and 1976...Became the 1st major leaguersince at least 1950 to tally 4 hits, including a walk-off hit, on his birthday...Since 1920 (when RBI became official) the only other Red Sox with a walk-off RBI on his birthday was Hal Wagner on 7/2/44 vs. STL (GM 2) with an 11th-inning single (Elias)...In the last 70 years, only 3 other Sox have had 4 hits and a game-ending RBI in a9-inning game: Carlton Fisk (7/28/75), Jeff Frye (6/14/99), and Shea Hillenbrand (4/15/03) (Elias).Hit in 13 of his last 16 tilts of the season from 9/8-10/3 at .375 (21-for-66) with 2 homers, 10 RBI, and 7 runs. Named Red Sox MVP by the Boston Chapter of the BBWAA and finished 2nd in American League MVP voting after leading the Majors in total bases (364) and extra-base hits (83).Also ranked among AL leaders in hits (3rd in ML, 212), RBI (T-6th, 105), runs (3rd, 119), AVG (5th, .321), SLG (6th, .552), OBP (9th), OPS (5th, .928), multi-hit games (T-5th, 59), stolen bases (4th, 39), doubles (T-3rd, 46), home runs (T-5th, 32) and at-bats (2nd, 660)...Was the 6th-hardest AL player to double up (82.5 AB/GIDP).Finished 2nd in AL MVP voting with 242 points, trailing Detroit's Justin Verlander (280).Was named MLB's AL Comeback Player of the Year after being limited to just 18 games in 2010 due to injuries...Also named Red Sox Comeback Player of the Year by the Boston Chapter of the BBWAA.Tabbed an All-Star for the 1st time in his career, elected via the Player Ballot...Took over in center field in the bottom of the 5th inning and went 0-for-2 in the 7/12 exhibition at ARI.Named an outfielder on the AL's Louisville Slugger Silver Slugger Team and the center fielder on the AL's Rawlings Gold Glove Team, his 1st time receiving either award...Became just the 6th AL player to be named an AllStar, Gold Glove and Silver Slugger in the same season as a center fielder, joining Ellis Burks (1990), Torii Hunter (2009), Ken Griffey Jr. (1991, 1993-94, 1996-99), Kirby Puckett (1986-89, 1992) and Grady Sizemore (2009).Was the 8th Red Sox outfielder to win a Silver Slugger, the 1st since Jason Bay in 2009...Joined Tony Armas (1984) and Ellis Burks (1990) as 1 of 3 center fielders in club history to win the award.His Gold Glove was the 1st since 1960 in which specific outfield positions were awarded rather than grouping all outfielders into a single pool of candidates...Was the 1st Red Sox outfielder to earn a Gold Glove since Ellis Burks in 1990 and the 5th to win it while serving as the club's center fielder (Jimmy Piersall, 1958; Reggie Smith, 1968; Fred Lynn, 1975 and 1978-80; Burks, 1990).Was the 1st primary leadoff hitter to top the Majors in total bases since San Francisco's Bobby Bonds in 1973 (341) and 1st Red Sox to lead the Majors in total bases since Tony Armas in 1984 (339)...Marked the most total bases by a Red Sox since Nomar Garciaparra in 1997 (365) and the most by a Boston outfielder since Jim Rice in 1979 (369).Was the 1st Red Sox to lead the Majors in extra-base hits since 1984 (Tony Armas and Dwight Evans, both 77).Was the 1st Red Sox ever to record 30 homers and 30 stolen bases in a single season and was 1 of 4 Major Leaguers to reach those marks on the year...Is 1 of 12 AL players ever to accomplish the feat (17 times). Became the 1st ever Red Sox with a 30 HR/100 RBI season while serving as the club's primary leadoff hitter...Was the 1st ML leadoff hitter to reach those marks since the Yankees Alfonso Soriano in 2002 (39 HR/102 RBI).With his 20th homer of the year on 8/13, became the 6th Red Sox (7th time) with 20 HR and 20 SB in a season, 1st since Nomar Garciaparra in 1997...With Dustin Pedroia (20 HR/26 SB), were the 1st Red Sox teammates to reach the 20/20 mark in the same year.Became just the 4th Major Leaguer ever to reach 200 hits, 100 RBI, 35 stolen bases and 30 home runs in a season...Was the 4th Major Leaguer (5th time) ever with 45 doubles, 30 home runs and 35 steals in a campaign.With his 169th stolen base on 8/19 at KC, passed Yastrzemski (168) for 3rd on the Red Sox all-time list.Set a Red Sox record with his 2nd errorless campaign as a Red Sox qualifier (also 2008)...Was the 1st qualifying Red Sox outfielder to turn in an errorless campaign while serving as the club's primary center fielder...Was 1 of 4 qualifying Major League outfielders that did not commit an error and led that group with 394 total chances.Led the AL in starts (152), innings (1,358.1) and putouts (388) at center field and ranked 2nd in the circuit in games (154) and total chances at the position...Had the 2nd-best zone rating among qualifying AL center fielders at .905...Picked up a career-high 2 outfield assists on 5/24 at CLE.Hit a team-leading 32 homers after tallying fewer than 10 long balls in each of his 4 previous campaigns...His 105 RBI ranked 2nd on the club to Adrian Gonzalez (117).Reached safely in 138 of 157 games with a plate appearance...Hit safely in 129 contests, 2nd most by a Red Sox since 1919 after Wade Boggs in 1985 (135).Boston was 62-23 (.729) when he scored a run, 45-21 (.682) when he drove in a run and 21-9 (.700) when he went deep.Tallied a season-high 4 hits on 4 occasions, matching his career high (7 times) and tied for 2nd most in the AL...Ranked 3rd in the AL with 20, 3+ hit games...Placed among AL leaders in AVG vs. RHP (3rd, .337), home AVG (6th, .326), road AVG (6th, .316), day AVG (2nd, .356) and RISP AVG (4th, .366).Was the 2nd Red Sox in the last 25 years to top 20 homers as a center fielder (Carl Everett, 33 in 2000)...Set club records for extra-base hits and total bases at the position (min. 100 G)...Had the most hits by a Red Sox center fielder since Tris Speaker in 1912 (222)...Speaker (53 in 1912) and Fred Lynn in 1975 (47) are the only Red Sox center fielders with more doubles in a season.Led the Majors with 110 hits, 61 runs, 22 homers, 61 RBI, 49 extra-base hits and 207 total bases against the AL East...Also topped Major Leaguers with a .365 AVG (301 AB) against the division (min. 45 AB)...Tied the club record for extra-base hits vs. the AL East, also Jim Rice in 1977.Led off 144 games, including his last 138 starts beginning 4/22...Paced the Majors in hits (203), doubles (45), extra-base hits (79) and total bases (345) out of the leadoff spot and led the AL in AVG (.327) and SLG (.556) from that position in the lineup...Was 2nd in the AL in homers (29) and OBP (.381) from the 1st lineup position.Hit 4 leadoff homers (6/7 at NYY, 6/17 vs. MIL, 7/6 vs. TOR, 7/27 vs. KC), tied for 3rd-most in club single-season history.Was the only Major Leaguer with multiple hit streaks of 18 or more games (19, 4/21-5/10; 18, 8/26-9/14)...Notched 5 hitting streaks of 10 or more games, matching the most double-digit hit streaks by any player in club history along with Tris Speaker (1912), Jimmie Foxx (1939), Wade Boggs (1985) and Nomar Garciaparra (1999).Named AL Player of the Week for 6/6-12, his 1st career weekly honor...Was 14-for-30 (.467) with 10 runs, 3 doubles, 1 homer and 4 RBI in the week, with at least 2 hits and 1 run in each of his 6 games during that stretch.Had an extra-base hit in a career-high 5 straight games, 9/4-8.Matched his career high for the 2nd and 3rd times with 2 homers on 7/20 at BAL and 9/25 at NYY (GM 1).After the All-Star break, led the Majors in total bases (187), extra-base hits (44) and homers (tied, 21)...Also ranked among AL leaders in the 2nd half in hits (T-2nd, 98), runs (T-2nd, 57), doubles (T-7th, 20), RBI (T-4th, 56), game-winning RBI (T-2nd, 10), SLG (4th, .625) and OPS (6th, 1.000)...Hit safely in 62 of 69 2nd-half contests.Posted his 3 best monthly home run and RBI totals in July (8 HR, 22 RBI), August (7 HR, 22 RBI) and September (8 HR, 21 RBI) after never before tallying more than 4 HR or 17 RBI in a month.Ranked among AL leaders in July with 8 home runs (T-1st), 77 total bases (2nd), 17 extra-base hits (2nd), 42 hits (3rd), 22 RBI (T-3rd) and a .382 AVG (5th)...His 8 homers were the most by a Sox center fielder in July since 1987 and the most in any month by a Sox center fielder since 2000 (Carl Everett, 9 in May 2000)...His 22 RBI in August led the team and ranked 6th in the AL.Led the Majors with 43 hits and 20 extra-base hits in September...Hit safely in 38 of his last 40 games beginning 8/16, batting .343 (59-for-172) with 30 extra-base hits (15 2B, 3 3B, 12 HR) and 31 RBI in that time.Connected for walk-off hits in consecutive games vs. CLE with a 2-out solo shot in the 9th on 8/2, the Sox 1st walk-off HR of 2011, and 1-out, walk-off RBI single on 8/3...Was the 1st Red Sox with walk-offs in consecutive days in the regular season since Butch Hobson in 1978 on 8/27 vs. CAL and 8/28 vs. SEA (David Ortiz did it in Games 4-5 of the 2004 ALCS vs. NYY on 10/17-18)...Became the 1st Major Leaguer to record his 1st 2 career walkoffs in back-to-back games since Pittsburgh's Jason Bay in 2008 vs. CHC on 5/24 and 5/25.Drove in a career-high 6 runs on 8/6 vs. NYY after never before recording more than 3 RBI in a game...Was the most RBI by a Boston center fielder since Carl Everett on 8/29/00 at TB (6) and the most by a Sox leadoff hitter since Ellis Burks, 6/10/87 at BAL (7)...Was the 1st time since 1920 (when RBI became official) that a Sox leadoff hitter had a 6-RBI game at Fenway...Was also the most RBI by a Sox leadoff hitter vs. NYY since 1920.Went deep in both ends of a twinbill vs. TB on 8/16, the 1st Red Sox to do that since Trot Nixon, 6/4/03 at PIT, and the 1st Red Sox to do it in Boston since Mo Vaughn, 6/10/97 vs. BAL...Did it again with 3 homers in a 9/25 doubleheader at NYY (2 HR in Game 1, 1 HR in Game 2).Hit his 1st career inside-the-park homer in the 7th inning of Game 2 on 9/19 vs. BAL, the 1st inside-the-parker by a Red Sox since Kevin Youkilis on 5/28/07 vs. CLE. Made 13 starts in center field and 5 in left (6 games overall)...Start in left field on Opening Day (4/4) vs. NYYmarked his 1st start at the position since 9/17/08 at TB.Suffered fractured ribs in a collision with Adrian Beltre in the bottom of the 9th inning on 4/11 at KC...Placedon the 15-day DL on 4/20 (retro to 4/12) and played 3 rehab games between Double-A Portland and Triple-APawtucket from 5/17-20, batting .400 (4-for-10) with a double, RBI, 4 runs, 2 walks and a stolen base...Activatedfrom the DL on 5/22.Played 3 games with the Red Sox from 5/22-24 before a 2nd trip to the 15-day DL on 5/28 with fracturedribs...Appeared in 6 rehab games with the Rookie-level Gulf Coast League Red Sox and Pawtucket, batting .409(9-for-22) with a double, RBI, 6 runs, 2 walks and a stolen base...Activated from the DL on 8/4.Tied Jerry Remy's club single-game record (6/14/80 at California Angels) with 4 stolen bases on 8/9 at NYY.Re-injured fractured ribs on 8/13 at TEX...Placed on the 15-day DL the next day (8/14) for the rest of theseason...Transferred to the 60-day DL on 9/25. Led the Majors and set a Red Sox single-season record with 70 stolen bases...Also finishedamong AL leaders in triples (T-1st, 10), multi-hit games (4th, 59) and hits (T-7th, 188)...Became the 2nd Red Sox player ever to lead the Majors in steals, 1st since Billy Werber's 29 in 1935...Alsojoined Werber (1934-35) as the only players in club history to lead the AL in thefts in back-to-back seasons...All 70 steals came as center fielder, most by AL player at the position since Brian Hunter's 74 for DET in 1997...Was the 1st AL player with at least 70 thefts and a .300 batting average in the same season since KennyLofton in 1996 (75 SB, .317)...Also the 8th American Leaguer ever to accomplish the feat (15th time)...Caught stealing on 12 of 82 attempts for an 85.4 percent success rate, 5th in the AL...Among American Leaguers with at least 70 steals in a season since 1920 (the year caught stealing began to be kept consistentlyin the AL), only 3 have posted higher percentages: Rickey Henderson (88.9%, 1985; 87.7%, 1988), Willie Wilson(87.4%, 1979; 88.8%, 1980) and Rudy Law (86.5%, 1983)...Recorded multiple steals on 8 occasions, tied for 2nd in the AL...Tied career high with 3 swipes, 5/2 at TB...Played in a career-high 153 games...Also set career marks in at-bats (624), hits (188), doubles (27), triples...(10), RBI (60) and walks (49)...Established full-season career highs in batting average (.301), on-base percentage(.355) and slugging (.415)...Started in the leadoff spot 117 times, reaching base safely in 100 of those games...59 multi-hit games were the most for a Red Sox center fielder since Doc Cramer's 60 in 1939...Talliedmultiple hits in a career-high 6 straight games from 7/24-29, going 13-for-28 (.464)...Hit .318 (61-for-192) against lefties, 5th in the AL among qualifying left-handed hitters...Finished 4th in the AL with a .268 clip (80-for-298) in 2-strike counts and led the Majors with a .319 average(37-for-116) after falling into an 0-2 hole...Marked the highest average by a Sox player in that situation sinceMike Greenwell's .342 clip in 1988...Placed 4th among AL center fielders with a .994 fielding percentage, making 2 errors in 363 total chances...Named Defensive Player of the Year by MLB.com as the online voting results of its 8th annual This Year inBaseball Awards...Stole home off Andy Pettitte in the 5th inning, 4/26 vs. NYY...Was the 1st Red Sox player to steal homesince Jose Offerman on the back end of a double steal on 8/30/99 vs. KC...Also 1st Sox player to succeed in a"straight steal of home" since Billy Hatcher, 4/22/94 vs. the Angels...Hit safely in a career-high 22 straight games, 5/2-27...Batted .340 (34-for-100) during the stretch...Tied for4th-longest hitting streak in the AL in 2009...Tied a Major League record for putouts by an outfielder in a 9-inning game with 12 on 5/20 vs. TOR...Hadbeen achieved twice previously, both times in BOS...Earl Clark vs. CIN at Braves Field on 5/10/29 and MIN'sLyman Bostock vs. the Red Sox on 5/25/77 (G2) at Fenway Park...Made 1st career error on 6/17 vs. FLA, ending a span of 232 games and 554 chances without a miscue...Marked the longest errorless streak ever by a Red Sox outfielder...Set a career high with 2 triples in a career-high tying 4-hit effort, 6/23 at WSH...Was the 1st Red Sox playerwith 4 or more hits in a game and at least 2 triples since Joe Foy on 6/23/67 vs. CLE...Stole 55th base of season on 8/25 vs. CWS, passing Tommy Harper for the franchise single-season mark of54 set in 1973...Swiped his 70th base in the final game of the season, 10/4 vs. CLE. In his first full big league season, led the A.L.in steals (50) and ranked among league leaders in infieldhits (3rd, 34), bunt hits (T4th, 10), triples (T6th, 7), andruns (T12th, 98)...Topped the club in triples, was 2nd inat-bats (554) and runs, tied for 2nd in games (145), and3rd in hits (155)....Started 63 games in center field, 36 inleft, and 30 in right without an error in 336 chances. ROOKIES CLASS: Led all rookies in at-bats, runs andsteals and matched Minnesota's Denard Span and SanFrancisco's Eugenio Velez for the most triples...Led A.L.rookies in games, hits and multi-hit games (40), was 3rdin total bases (218), 5th in walks (41), and 7th in extrabasehits (38)...Had the most games, at-bats, runs andtriples for a Red Sox rookie since Nomar Garciaparra in 1997 (153 G, 684 AB, 122 R, 11 3B). STEAL CITY: His 50 steals were 3rd most in Red Sox history behind Tommy Harper (54) in 1973and Tris Speaker (52) in 1912...Were 3rd most in the majors trailing Colorado's Willy Taveras (68)and the New York Mets' Jose Reyes (56)...Was the first Boston player to lead A.L. in steals sinceHarper in 1973 and just the 2nd in the last 54 years (beginning 1955)...Was the first rookie to tophis league in stolen bases since Seattle's Ichiro Suzuki (56) in 2001...Were most steals by ML rookiesince Florida's Hanley Ramirez (51) in 2006, most in A.L. since Ichiro in 2001...Was 20th rookie inML history with 50+ SB...Finished 7th in the A.L. with an 82.0 percent success rate (50 of 61).Set a club record with 14 multi-steal games, tying Taveras for the major league lead...Stole 3 baseseach in consecutive games, May 30-31 at Baltimore, the most in one game for a Red Sox sinceJerry Remy's club record 4 on June 14, 1980...Was the first Sox player with as many as 6 swipes inconsecutive games since research is first available in 1954...Tied for the ML lead with 18 steals inMay, matching the most for a Red Sox in a single month since 1954 (Harper in September 1973).Succeeded in season's first 16 attempts before being caught on May 18 vs. Milwaukee...Ended astring of 25 successful tries to start his career, longest ever by a Red Sox and longest in the majorssince Montreal's Tim Raines went 27-for-27 from 1979-81...Stole 35 bases in first 39 attemptsthrough July 1, then went 25 games without a theft through August 4...Had 2 steals in last 12games...Was 8-for-10 in steal tries of 3rd...4 of 11 caught stealings came on pitcher pickoffs. WITH THE BAT: Was 7-for-33 (.212) in season's first 15 games before hitting at a .321 (36-for-112)clip over next 30 games, improving to .297 through May 23...Batted .244 (53-for-217) in next 35contests, improving to .258 on August 12...Had a .315 (56-for-178) average in his final 44 games.Hit safely in final 18 games beginning September 10 at .370 (30-for-81)...Was the longest hittingstreak by a major league rookie since Anaheim's Robb Quinlan (21) in 2004 and the longest by aRed Sox first year player since Garciaparra's club-record 30-gamer in 1997...Finished the year withthe longest active streak in the majors.His 34 infield hits were the most by a Red Sox since Johnny Damon (37) in 2002...Homered twiceon April 22 vs. the Angels with first-inning leadoff homers in that game, May 21 against KansasCity, and September 26 vs. New York...Went deep in back-to-back games, August 6 and 9. FIELDING: Did not make an error in 140 games and 336 total chances, the first rookie qualifyingoutfielder ever with a 1.000 fielding percentage in a season...Had the 2nd most chances withoutan error of any major league outfielder behind the Angels' Torii Hunter (353)...Established clubrecord for consecutive errorless outfield chances in a season and tied Carl Yastrzemski (1977) formost consecutive errorless games in a year...Damon held the total chances mark at 307 in 2002.Has not made an error in 173 games and 410 chances in his major league career, the 2nd longestoverall outfield errorless streaks in team history to 178 games for Mike Greenwell, 1993-94 and429 chances for Coco Crisp, 2006-07. BY THE NUMBERS: Was Boston's primary leadoff hitter, batting .272 (135-for-497) in 115 games inthe top spot...Hit .277 (38-for-137) with runners in scoring position...Has reached base safely viaa hit, walk, or HBP in 141 of 168 ML games with a plate appearance. TOP PROSPECT: Entered 2008 as the No. 2 prospect overall and the No. 1 position player in the Red Sox organization, according to Baseball America...The same publication also rates him as theFastest Baserunner, Best Athlete, and Best Defensive Outfielder in the Sox system. MAJOR LEAGUE SUMMARY: Advanced from Double-A Portland to Triple-A Pawtucket beforemaking his major league debut over 3 stints with Boston...Hit safely in 27 of his 32 major leaguegames with an at-bat, including a 13-game hitting streak from September 1-15, during which hehit .426 (20-47) with 3 doubles, a triple, 3 home runs, 13 RBI, 11 runs, 4 stolen bases and 2 walks...Reached base via hit, walk, or hit-by-pitch in 29 of 32 overall big league games with a plate appearance,including 26 straight games from July 2-September 26...Had the A.L. 's 10th highestbatting average for September at .361 (35-for-97), tied for 4th with 8 steals, and tied for 9th inhits...Hit safely 23 of 26 games after final recall from Triple-A Pawtucket on September 1 with 6doubles, a triple, 3 homers, 17 RBI, 16 runs, and 8 stolen bases...Homered 3 times in 116 majorleague at-bats after producing just 2 homers in 436 minor league at bats all year...Went 9-for-9 instolen base attempts with the Sox, the first Boston player to be successful in as many as his first 9major league steal attempts since Nomar Garciaparra in 1996-97...Went 6-for-19 (.316) in 7 gamesover his first two stints (June 30-July 5; August 17) with Boston. AWARDS AND HONORS: Earned American League Rookie of the Month honors for September2007, his first full month in the major leagues...Was also named Red Sox Minor League DefensivePlayer of the Year and Baserunner of the year, receiving both awards for the 2nd straight season...Was selected to play for the United States Team in the 9th annual Major League All-Star FuturesGame on July 8, 2007 in San Francisco...In 2006, was honored as the Red Sox Minor League Playerof the Year by the Boston chapter of the Baseball Writers Association of America and repeated asa co-winner with Clay Buchholz in 2007. IN THE POSTSEASON: Appeared in 11 post-season games in 2007, including the start in each ofBoston's final 6 contests...Batted .360 (9-25) with 4 doubles, 4 RBI, 8 runs, 3 walks and 2 stolenbases...His 4 doubles all came in the World Series, 2 shy of the most doubles ever in a single WorldSeries by a rookie (6), established by Detroit's Pete Fox in 1934...All 6 of his starts came in centerfield,but also saw action at both of the corner outfield positions in the playoffs.Went a combined 6-for-9 with 4 doubles, 2 RBI and 3 runs in Games 3 and 4 of the World Series,his only 2 starts of the post-season from the leadoff spot in the order...That included going 4-for-5 with 3 doubles, 2 RBI and 2 runs in Game 3 on October 27 at Coors Field...Became just the 3rdrookie ever to collect 4 hits in a post-season game, joining Fred Lindstrom (1924 Game 5 for NYGiants) and Joe Garagiola (1946 Game 4 for STL)...His 3 doubles tied for 2nd most ever in a WSgame behind Frank Isbell (CWS) on October 13, 1906...Had 2 doubles in the 3rd inning, becomingthe 2nd player in WS history to have 2 doubles in an inning, joining Arizona's Matt Williams onNovember 3, 2001 (3rd inning)...Became the first rookie to bat leadoff in a World Series gamesince Timo Perez led off for the Mets in Game 4 of the 2000 WS vs. Yankees. MINOR LEAGUE SUMMARY: Combined to bat .323 with 82 runs, 2 homers, 41 RBI, and 41 stolenbases in 104 games with Portland and Pawtucket...Led all Red Sox minor leaguers in stolen basesand ranked 4th in batting average...After hitting .452 in 17 games to open the year at Portland,had a .298 average with 33 stolen bases, tied for the International League lead at the time, in 87games with the PawSox...Established a Pawtucket franchise record with a 25-game hitting streakfrom July 21-August 30...Overall, hit safely in 38 of 40 games between Pawtucket and Boston from July 21-September 15. STREAKING SUCCESS: His 13-game hitting streak withBoston was the longest by a Red Sox rookie outfieldersince Jim Rice (13) in 1975...Tied for the 2nd longeststreak by a major league rookie in 2007, one gameshy of Dustin Pedroia's 14-game run from May 19-June 4...Marked the first time 2 Red Sox rookies hadhitting streaks of 13 or more games in the same seasonsince Fred Lynn (20) and Rice (13) in 1975. INSIDE THE NUMBERS WITH BOSTON: Appeared in 22games (15 starts) in left field, 16 games (12 starts) incenter and made one start in right...Batted in everyspot in the order except 3rd and 5th, with most of hisaction coming out of the leadoff spot (13 games)...Originally had his contract purchased on June 30,when Joel Pineiro was placed on the disabled list...Made his major league debut that night vs. Texas, collectingan infield single in the 3rd inning off RobinsonTejeda for his first major league hit...Went 6-for-16(.375) in 6 games before being optioned back to Pawtucketon July 5...Was recalled in between games of adoubleheader on August 17...Played the night gamevs. the Angels before being optioned again after thegame...Stayed with Boston for the remainder of theseason after being recalled again on September 1...His first major league home run was a solo shot offDaniel Cabrera on September 2 vs. Baltimore...Fell adouble shy of the cycle on September 4 vs. Toronto, going 3-for-3 with 2 RBI and a stolen base...Also matched his season high with 3 hits in the final game of the regular season, September 30vs. Minnesota. WITH PAWTUCKET: Was promoted to Boston for the 3rd and final time the day after his 25-gamePawtucket hitting streak was snapped...Departed in a 3-way tie for the International League leadwith 33 stolen bases...In 87 games with Pawtucket, hit .298 with 14 doubles, 5 triples, 2 homeruns, 28 RBI, and 33 steals in 39 attempts...Played 84 of his 87 games in the outfield (65 in center,12 in left, and 7 in right) and batted exclusively out of the leadoff spot...His 25-game streak startedon July 21, was then interrupted by disabled list stint due to a groin strain, and continued fromAugust 5-30...Eclipsed the previous franchise-record 19-game hitting streaks by Dave Stapletonin 1979 and Dave Berg in 2005...Ellsbury batted .377 (40-for-106) during his streak, which was the2nd longest streak in the International League in 2007 behind only Brandon Watson of Columbus,who put together a 43-game hitting streak earlier in the season. WITH PORTLAND: Hit .452 with 13 RBI in 17 games for the Sea Dogs...At the time of his May 4 promotionto Pawtucket, had the highest batting average in minor league baseball and produced a19-game hitting streak from April 11-May 7 with the 2 teams...Was selected as the April Player ofthe Month in both the Eastern League and the Red Sox minor league system...Hit .455 (30-for-66)with 10 doubles, 2 triples, 12 RBI, 13 runs and 6 steals in 15 April games with Portland. SUMMARY: Enjoyed a highly-celebrated 2nd professional campaign, batting a combined .303(134-for-442) with 7 homers and 51 RBI in 111 regular season games with Single-A Wilmingtonand Double-A Portland...had 41 stolen bases and committed just 2 errors in 109 total starts in centerfield...led all Red Sox minor leaguers in stolen bases and ranked 3rd in batting average despitespending time on the disabled list from April 27-May 21 with a strained right quadriceps muscle. WITH WILMINGTON: One of 3 Blue Rocks named tothe mid-season Carolina League All-Star team, batted.299 (73-for-244) with 4 homers, 5 triples, 32 RBI and25 stolen bases in 61 games for Wilmington to earna July 12 promotion to Portland...hit .304 (21-for-69)with 3 doubles, 2 triples, a homer, 11 RBI, 11 runs and7 steals in 17 games before going on the D.L. and batted.297 (52-for-175) with 4 doubles, 3 triples, 3 homeruns, 21 RBI, 24 runs and 18 steals in 44 games afterbeing reinstated...earned the Sox' Base Runner of theMonth Award in April after legging out 3 doubles, 2triples and going 7-for-8 in stolen base attempts...hitsafely in 12 of his first 13 games of the season, batting.357 (20-for-56) with 10 RBI, 10 runs scored and 6 stolenbases...was also hot after coming back from theD.L., hitting .355 (39-for-110) in 27 games from May22-June 20...hit safely in 8 of his final 10 games withWilmington, going 12-for-41 (.293), but closed his Single-A stint by hitting just .200 (13-for-65) over his final 17 contests...overall with Wilmington, batted .315(17-for-54) with runners in scoring position, including.333 (10-for-30) in those situations with 2 outs. WITH PORTLAND: Joined the eventual Eastern League champion Sea Dogs on July 13 and wenton to hit .308 (61-for-198) with 10 doubles, 3 triples, 3 home runs, 19 RBI, 29 runs and 16 stolenbases in 50 games over the remainder of the season...the left-handed hitter batted .389 (21-for-54) against lefties and .278 (40-for-144) off righties...got off to a fast start with Portland, hittingsafely in his first 10 games with an at-bat, going 16-for-45 (.356) with 3 doubles, 6 RBI, 6 runs and6 stolen bases...was batting .333 in his first 31 Double-A contests through August 13, a periodthat saw him earn Eastern League Player of the Week honors for August 7-13...batted .400 (10-for-25) with a double, 2 triples, his first Double-A home run, 7 runs scored and 3 RBI during theweek...went 8-for-10 in stolen base attempts in July to earn the Sox' Minor League Base Stealerof the Month Award...put together his 2nd 10-game hitting streak with Portland from August6-18, when he went 15-for-39 (.385) with 2 homers, 6 RBI and 9 runs...with the Sea Dogs, hit .333(14-for-42) with runners in scoring position. EASTERN LEAGUE PLAYOFFS: Started and batted leadoff in all 9 of Portland's playoff games,batting .282 (11-for-39) with a home run, 6 RBI and 8 runs scored...went 4-for-16 (.250) in Portland's4-game series win over Trenton in the EL Northern Division Championship Series and 7-for-23 (.304) in the Sea Dogs' 5-game EL Championship series win over Akron. ARIZONA FALL LEAGUE: Appeared in 26 games for the Peoria Javelinas of the Arizona FallLeague, batting .276 (29-for-105) with 4 doubles, 3 triples, 3 RBI, 18 runs and 7 stolen bases. Boston's top pick in the 2005 draft made his pro debut with short-season Single-A Lowell and batted .317 with five triples, one homer, 19 RBIs, 28 runs scored and 23 stolen bases in 35games...had 24 walks and just 20 strikeouts to contribute to a .418 on-base percentage...rankedsecond in the New York/Penn League in stolen bases and fifth with five triples...hit .371 (13-for-35) withrunners in scoring position...was named Red Sox Minor League Base Stealer of the Month for July,when he went a perfect 9-for-9 in stolen base attempts...had a season-high three stolen bases in hisseason finale Sept. 8 at Oneonta...finished his season strong, hitting safely in 17 of his last20 games, including a .412 mark (14-for-34) in eight games in September...fell a homer shy of the cycleon Sept. 1 vs. Vermont as part of a 4-for-5 effort. April 16, 2019 New York Yankees transferred CF Jacoby Ellsbury from the 10-day injured list to the 60-day injured list. Left hip surgery.recovery. March 28, 2019 New York Yankees placed CF Jacoby Ellsbury on the 10-day injured list retroactive to March 25, 2019. Left hip surgery. November 1, 2018 New York Yankees activated CF Jacoby Ellsbury from the 60-day injured list. May 2, 2018 New York Yankees transferred CF Jacoby Ellsbury from the 10-day disabled list to the 60-day disabled list. Right oblique strain. March 29, 2018 New York Yankees placed CF Jacoby Ellsbury on the 10-day disabled list retroactive to March 26, 2018. Right oblique strain. June 26, 2017 New York Yankees activated CF Jacoby Ellsbury from the 10-day disabled list. June 24, 2017 New York Yankees sent CF Jacoby Ellsbury on a rehab assignment to Scranton/Wilkes-Barre RailRiders. June 3, 2017 New York Yankees placed CF Jacoby Ellsbury on the 10-day disabled list. Concussion. May 25, 2017 New York Yankees placed CF Jacoby Ellsbury on the 7-day disabled list. Concussion. July 8, 2015 New York Yankees activated CF Jacoby Ellsbury from the 15-day disabled list. June 29, 2015 New York Yankees sent CF Jacoby Ellsbury on a rehab assignment to Tampa Yankees. December 7, 2013 New York Yankees signed free agent CF Jacoby Ellsbury. July 13, 2012 Boston Red Sox activated CF Jacoby Ellsbury from the 60-day disabled list. July 7, 2012 Portland Sea Dogs sent CF Jacoby Ellsbury on a rehab assignment to Pawtucket Red Sox. July 4, 2012 Jacoby Ellsbury assigned to Portland Sea Dogs from GCL Red Sox. June 29, 2012 sent CF Jacoby Ellsbury on a rehab assignment to GCL Red Sox. May 13, 2012 Boston Red Sox transferred CF Jacoby Ellsbury from the 15-day disabled list to the 60-day disabled list. April 14, 2012 Boston Red Sox placed CF Jacoby Ellsbury on the 15-day disabled list. Subluxation of his right shoulder. November 8, 2010 Boston Red Sox activated CF Jacoby Ellsbury from the 60-day disabled list. September 25, 2010 Boston Red Sox transferred LF Jacoby Ellsbury from the 15-day disabled list to the 60-day disabled list. August 14, 2010 Boston Red Sox placed LF Jacoby Ellsbury on the 15-day disabled list. Rib injury. August 4, 2010 Boston Red Sox activated LF Jacoby Ellsbury from the 15-day disabled list. July 31, 2010 sent LF Jacoby Ellsbury on a rehab assignment to Pawtucket Red Sox. July 26, 2010 Boston Red Sox sent LF Jacoby Ellsbury on a rehab assignment to GCL Red Sox. May 28, 2010 Boston Red Sox placed LF Jacoby Ellsbury on the 15-day disabled list retroactive to May 25, 2010. Left chest contusion. May 22, 2010 Boston Red Sox activated CF Jacoby Ellsbury from the 15-day disabled list. May 18, 2010 Pawtucket Red Sox sent CF Jacoby Ellsbury on a rehab assignment to Portland Sea Dogs. May 17, 2010 sent CF Jacoby Ellsbury on a rehab assignment to Pawtucket Red Sox.